The mission of the Mycofiltration team was to find a low cost solution to water filtration using mushroom mycelium as the media. At HERDS, the team was able to develop a system to test the filtration potential of various configurations of filtration units of mycelium. The units were constructed with modified plastic shelving as the structural basis with mycelium networks grown inside. PVC piping transports water throughout the system. The mission of the Mycofiltration team was to find a low-cost solution to water filtration using mushroom mycelium as the media. At HERDS, the team was able to develop a system to test the filtration potential of various configurations of filtration units of mycelium. The units were constructed with modified plastic shelving as the structural basis with mycelium networks grown inside. PVC piping transports water throughout the system. The Concrete Testing project intends to investigate common testing procedures and methodologies for evaluating concrete strength in order to create a feasible method for testing concrete in Haiti. Their team will be able to use a hydraulic jack and 100 ton, 50 ton, and 20 ton hydraulic rams to simulate common testing procedures from international standards. These jacks will help evaluate which of these methodologies would be most feasible in developing countries. The Hydropower team is not consistently at HERDS, but the project has also leveraged the space. 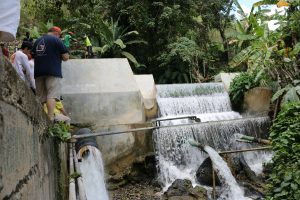 The objective is to outline and implement a plan for an electric turbine system to provide consistent power to the Zanmi Lasante medical facilities located in Cange. 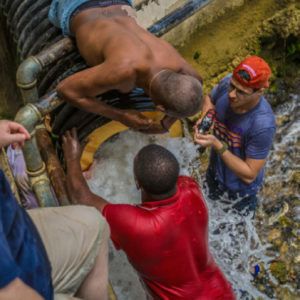 Over the 2017 spring break trip, the team needed to determine the amount of excess water available from the dam in Bas Cange. To do so, the team created an orifice plate, which restricts flow to a known diameter. From these dimensions and the pressure differences in the system, the flow could be calculated. A router was used to cut the main plate out of plywood and variable plates out of plexiglass, which were then all taken on the commercial flight down to Haiti. The group, in collaboration with an equipment provider, has been able to estimate the size of the hydroelectric turbines using this data. The Water From Air team is tasked with determining if it is feasible to produce a significant amount of clean water from water vapor in the air with a low-cost design. One concept involves a medium that absorbs the water vapor from air during cool evenings. When the medium is warmed during the day by the sun, the water vapor will evaporate in the clear container. In the evening, this vapor will condense onto the walls of the container, resulting in liquid water that can be collected. The cycle is repeated daily. A prototype for such a device was constructed and tested at HERDS, made primarily of clear plexiglass, PVC, and wood. The Sand Filter team is investigating the reliability of slow sand filters as a means to inexpensively filter potable water. They have been able to construct and build a prototype using PVC and garbage bins. A proof-of-concept study of their system has been conducted at HERDS, which the team will build on in coming semesters. The Solar Fridge Project has been one the most active groups at HERDS because of their complicated build. The team aims to harness the power of the sun by concentrating light onto the heating element of a fridge, with the intention of providing a reliable and consistent way of keeping vaccines from spoiling. The prototype involved significant woodworking, mechanical elements, and electronic integration. From handsaws and screwdrivers to miter saws and electric drills, this project has used a variety of the woodworking tools available at HERDS. The prototypes complex electronic integration and coding has been made possible by the wiring and circuit testing equipment along with multiple Arduino and breadboard options. A finished prototype will automatically track the sun and adjust the position of the lens to keep the energy focused in the right area. The Do It Yourself (DIY) Water Filter team is investigating the contributing factors to a reliable filter using acrylic yarn as the media by varying tension, number of layers, and the pattern of layers. Factors for success include reasonable flow rate and World Health Organization potable water standards for pH, turbidity, and total dissolved solids. Many filters have been constructed in order to test the wide range of necessary variables, which was possible because of the expendable resources like 5-gallon buckets, yarn, and PVC available at HERDS. The Ram Pump team is working to develop a hydraulic ram pump design that will be implemented in developing areas in need of an efficient and electricity free method for pumping water. The prototype shown below has a variety of valves and fittings made from both PVC and copper. The pump will be tested in HERDS to help the team determine best practices for construction and usage of their design. The goal of the Water Analysis group is to improve data collection of the Cange Water System. Currently, data such as turbidity, pH, and chlorine is collected and recorded by hand. High-end methods of automatically collecting and transmitting data are typically very expensive, so their team is investigating a more cost-effective solution. A variety of inexpensive sensors were mounted to the board shown below. In addition, high end Hach equipment was added to the same system to verify the cheaper sensors’ accuracy. HERDS allowed for the construction and preliminary testing of the solution the team came up with.